Delicious with either shrimp or chicken, sprinkling the crispy rice noodles on top adds a surprising crunch and makes a lovely presentation. DressingFor the dressing, whisk the vinegar, teriyaki sauce, sesame oil, lemon juice, sesame seeds, honey or sugar, and garlic in a small bowl. Cover and refrigerate. ShrimpIn a shallow dish, mix the soy sauce, ginger, lemon zest, and lemon juice. Add the shrimp and stir to coat. Let stand for 10 minutes. Heat the oil in a large nonstick skillet over medium-high heat. Add the shrimp and cook, turning once, until pink, about 4 minutes. Transfer to a plate. SaladIn a large bowl, mix the cabbage, celery, scallions, bean sprouts, carrots, cashews, water chestnuts, and cilantro. Add the dressing and toss to combine. Bring a large pot of water to a boil. Add the dried rice noodles and cook for 4 to 5 minutes, or until al dente; drain. Arrange the salad in the center of a platter and top with the shrimp. 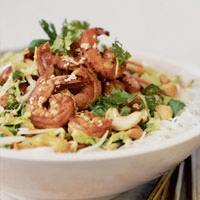 Place the rice noodles around the salad and present scattered with the crispy noodles on top, if desired. Chicken (if used)In a shallow dish, mix the soy sauce, ginger, lemon zest, and lemon juice. Add the chicken and stir to coat. Let stand for 10 minutes. Heat the oil in large nonstick skillet over medium heat. Add the chicken and cook, turning once, about 6 minutes, until just cooked through. Transfer to a cutting board and cut the chicken into strips. Once the salad is arranged, top with the chicken strips. Nutrition Note: Nutrition Facts calculated using shrimp.